One of the automotive hobby’s most endearing and recognizable names began in 1958 with the Chevrolet Bel Air Impala. It featured more chrome and trim than previous editions of the Bel Air which helped solidify the Impala as one of Chevrolet’s top of the line vehicles thereafter. Yet it wasn’t until 1961 that Chevy would fit the Impala with the Super Sport options that are in the highest demand today. One particular year became the focus of some research here at Cars On Line when a customer asked us to help prove his 1965 Chevy Impala Convertible was a true Super Sport. What we found could be helpful to you if you ever need to prove your SS is true too. When the Super Sport option arrived in 1961, it was priced at just $5,380 and included knock-off wheel covers, heavy duty springs and shocks, metallic brake linings, padded instrument panel, a Sun 7,000-rpm tachometer on the steering column, and 8×14 narrow-band whitewall tires. 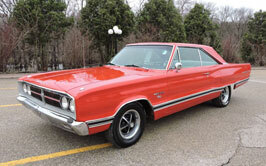 The engine was available in three versions of 348ci V8s ranging from 305 to 350 horsepower, and in the legendary 409. 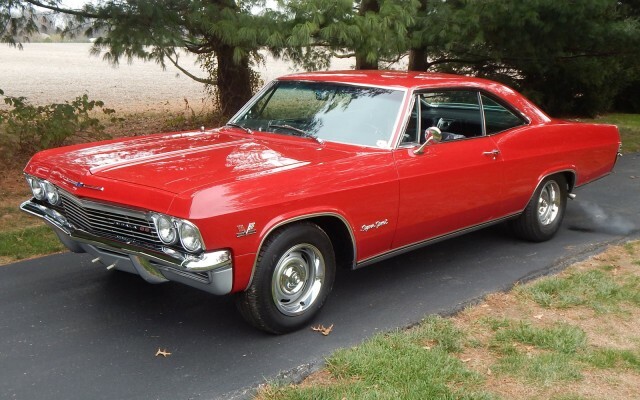 Only 453 Impalas were made with the SS option and just 142 of those held the big 409ci engine. Just as with the Chevelle SS 396, the VIN number can play an important part in determining the originality of your SS. In 1964, the Impala SS earned its own model designation, and by 1965 production numbers ballooned to 243,114 Impala SS’s built. The unique VIN number would stick all the way through 1967, with V8 models designated with a 166 prefix and regular Impalas designated with a 164 prefix in the VIN. You can look for the trim tag on the interior of the driver side door. Compare it to the VIN number printed on the build sheet, usually found under the back seat unless it’s already been removed, a likely possibility with older vehicles. Then use an internet de-coding website to see what the VIN is telling you. Impalas.org has information necessary to decode each VIN. One important note about the VINs though–the information on how to read the VIN code on an Impala changes if the car was built in Canada, as 1965-1966 Canadian-built Impalas utilized a different VIN code format. Unique features for the 1965 SS included a “blackout” trim strip that ran under the taillights, an exterior that differed slightly from regular Impalas, the absence of Rocker panel or lower fender trim, “Super Sport” scripts that replaced the customary “Impala SS” badges, a rally-type electric clock in the center console, and full instrumentation that included a vacuum gage. Bucket seats were only available with the Super Sport option, and bucket seats have their own trim codes, which are easy to find in other printed sources. Turbo Hydra-Matic, a 250ci 6-cylinder engine, and a 396ci Turbo-Jet V8 became options as well, while the dual-carb 409 was dropped. The 396ci Turbo-Jet V8 was a mid-year addition and came in a 325 horsepower version and a 425 horsepower edition with an 11:1 compression and solid lifters. As is often the case with collector cars, telling the difference between these two engines can be difficult unless you have the build sheet, window sticker, or other credible documentation on hand. If you don’t have documentation though, you can start with comparing the engine and VIN numbers. Matching numbers will tell you if the engine is original to the car, an excellent first step. There were only 1,838 396’s installed in all B-bodies for 1965. Chevrolet was still in the process of phasing out the 409, so even the 325 horsepower Impala SS are a rare breed. The 396 was introduced on February 15, 1965, so check for a casting date after that and a build date of mid-February or later. The 425 horsepower block casting number for 1965 was 3855962, and was stamped with “Spec. High Perf.” next to the number. It will be a 4-bolt block with an “IE” suffix in the engine pad stamp, and all were paired with manual transmissions. Check the lower right side of the block next to the freeze plug and in front the starter motor for the casting numbers. Finally, there were no dowl pins used on the timing cover for the 425 horsepower motor. Ultimately, we concluded that our customer did not have an original Impala SS on his hands. It was sold to him as an SS, and he took the seller on their word despite not having any supporting documentation. Sometimes this gamble might pay off. Most of the time it won’t, which is why we recommend all vehicles get inspected before making a decision to purchase. Services like Cars On Line’s Inspection Service can take some of the guess work out of buying a collector car. A little research can save you thousands.